The minute you step aboard the intimate Boudicca you'll discover stylish modern public areas, a friendly staff and a home-away-from-home atmosphere. Spend the day poolside catching the sun's rays, take a quick dip in the pool or swim a few laps in the exercise pool. Pamper yourself with a body treatment at the spa or join a pick up game of bridge. Dine on delish cuisine at the two main restaurants or enjoy a casual meal at the Secret Garden. Meet up with new found friends for an after dinner cordial before the evening show or dancing. After a long day retire to your comfortable stateroom to rest your head and dream of all the exciting activities and ports of call tomorrow will bring. The ship, staff, food and service were wonderful as always. An experience but we would not go back to Arabia. The temp was in the 100's which meant we tried to stay out of it as much as possible. Going down the Red Sea is a bit scary as they have 'pirate watch' and safe havens on ship if we should encounter any. 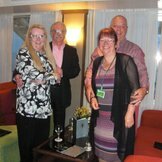 All in all a wonderful cruise as we always have with Fred Olsen. 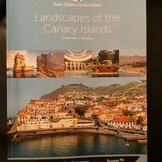 A wonderful cruise with good weather when it mattered, on a comfortable ship with great crew, fantastic food and interesting companions, around the Canaries, Maderia and Gibraltar. Can life get any better?